For months now, American citizens of all ages, political affiliations, and backgrounds across the nation have been calling on President Obama to step up to the plate and speak out to rein in the government’s management of the Wild Horse and Burro Program and America’s mustangs and burros. Despite campaign promises that he was squarely for protecting our wild herds, once elected, the President’s ongoing silence has become a deafening roar as concerns and pleas for intervention continue to be meet with nothing more than a Presidential cold shoulder. 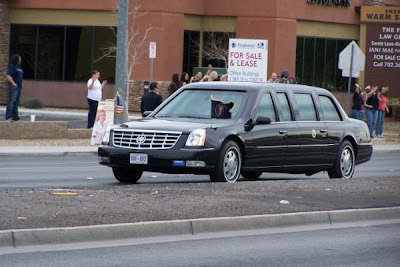 last month during the President visit to Las Vegas. Photo courtesy of Arlene Gawne. Mr. Obama is obviously capable of taking swift and decisive action to speak out on issues of national importance, such as his immediate confession that “he loves Las Vegas” to appease the political fallout out and media backlash resulting from his targeting of Vegas as the national Icon of Excess. However, it appears the President’s compassion doesn’t extend as far for the ongoing plight of America’s mustangs and burros or their own national iconic status as it does for dinging the reputation of glitzy and glamorous fabulous Las Vegas. 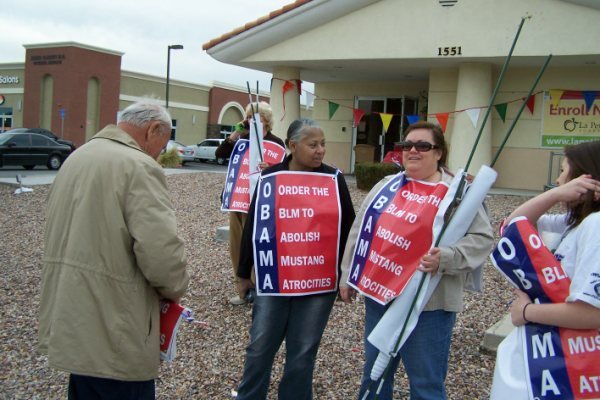 While President Obama’s limousine cruised down the streets to make amends and present apologies over champagne, wild horse and burro advocates tracked his brigade in efforts to be heard. Does the sign above the Presidential limousine accidentally capture the truth of President Obama's real agenda? Photo courtesy of Arlene Gawne. Catapulted into office by a world hungry for change, Mr. Obama baited his audience with such promises as transparency, open government and giving the people a voice. Since his arrival at the White House, too often we have only seen more of the same! In late January, 2010, Public Employees for Environmental Responsibility (PEER), a long-standing organization developed and dedicated to protecting government whistle blowers who tell the truth about what is really happening behind the scenes, issued a news release detailing how the Obama administration planned to deal with the transparency issue and government workers. Highlighting key issues and tactics being used to shut down government transparency, PEER outlines how, after President Obama issued a “signing statement” in March 2009, he authorized extending his control for restricting information and public access to even include restricting federal employees’ ability to provide information to Congress, [which includes] “his inherent authority to ‘supervise, control, and correct employees’ communication with the Congress”. While I may not have the credibility or long-standing weight of PEER, since President Obama’s arrival on the American scene with his promises of transparency, open government and change, my own experiences mirrors PEER’s report as communications with government personnel have all but dried up. As public affairs specialists have taken center stage to orchestrate spin, myths and continued propaganda, the agencies themselves are echoing the same deafening Obama silence that continues to ring across the nation and abroad as the war on America’s mustangs and burros continues, unabated. On Thursday, citizens from across the nation went to Washington D.C. to "March for Mustangs", with support from simultaneous protests in Las Vegas, Los Angeles and London. It has been reported that the Washington protesters were met with mounted police, armed guards, had their photos snapped by some secret service type guy and were forbidden to set foot on the steps of the Department of the Interior. Across the sea, London protestors raised their voices in support and unison demanding real change and a halt to the destruction of these - our national treasures. Included in the protesters were singer/songwriter Maria Daines and guitarist Paul Killington, whose passionate words and praises for these fast-disappearing American icons show how these magnificent animals are loved throughout the world! Below is a video of Paul Killington leaning against a monument to former President Dwight D. Eisenhower in front of the American Embassy as he joins the call to President Obama to SAY SOMETHING about the war being waged against America’s mustangs and burro. I thought it would be appropriate to reminisce about what former President Eisenhower had to say before he departed from the American stage – since President Obama still has nothing to say…. People from anywhere or everywhere around the world can help free these innocent mustangs from the cages or prisons, the gulogs the US government has wrongfully put them in by simply boycotting beef. BLM is the agribussiness of beef. Choosing wisely what we eat, or ecconomic santions against the cattle industry that has taken the the mustangs land as well as our own land, our land of the free, will set the land and the mustangs free. And the beauty of this simple action of not eating beef to free the mustangs is that it is free. Please stop eating beef and the mustangs will be freed. Anon ~ I know you mean well, but our Public Lands ranchers supply only 3% of the beef eaten in the US yearly. The only way boycotting beef would catch their attention would be for everyone in the WORLD to stop eating beef, and that just isn't going to happen. We have to concentrate on other ways. The Meat Industry was recently frantic over one Meat Out Day (can't remember the state now-Wisconsin?). Can you imagine if people starting opting for other meat or no meat until all wild horses and burros are save? It doesn't take the whole world to do anything to get something done. Just a handful to start a movement; that is scary enough for these folks, in case it really catches on.